Maintain the perfect home & garden, with home improvement tools that will have all of your indoor and outdoor living spaces covered. Home Improvement Tools - Whether you're painting the house or hanging Christmas lights, cleaning the car or cultivating your garden, Sporty's Tool Shop is your go-to catalog for quality home improvement tools that can and will tackle any job on the home front. From large outdoor maintenance gear like ladders and lawn mowers to small handy home & garden maintenance tools like Swiss army knives, screwdriver sets and shears, you'll find everything you need to keep your home, lawn and garage in top form. Automotive - Tend to your home on wheels with a wide selection of car cleaning and maintenance supplies, car mats and seat covers, tarps, ratchets, wrenches, ice scrapers, and tools for emergency roadside assistance including automotive pumpers, jump starters, generators, traction mats, air compressors and more. You'll also find automotive themed decor, organization, storage items and garage mats that will help you maintain a five-star garage. Kitchen & Utility - Make your kitchen and laundry rooms more efficient and user-friendly with a variety of home improvement tools that will make cooking and laundering less of a chore. Browse an assortment of kitchen storage solutions from expandable shelves and roll out cabinet drawers to folding step stools and every day gadgets like jar openers, travel mugs and beverage dispensers. Fluff and fold with Hold It & Fold It laundry workspaces, dryer vents and more laundry room remedies. 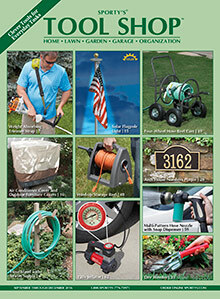 Lawn & Grounds Care - Gain curbside appeal and make your garden the most envied one on the block with all-purpose home & garden maintenance supplies that will keep your lawns perfectly manicured and your gardens blooming. Fill your garden sheds and garages with lawnmowers, garden tools, carts, wheelbarrows, pest control, pruners, sprinklers, weeders, tillers, timers and more basics in outdoor maintenance. Organization - A well organized home is a happy home. Keep all of your most cluttered areas neat and streamlined with organizational products for every corner. Choose from garage space savers and storage units, kitchen storage racks, workshop supplies, lifts, bike racks, coil keepers, storage crates, and magnetic holders that will neatly store and house all of your go-to home improvement tools until future use. Patio & Grill - Make outdoor entertaining easy with Sporty's Tool Shop supply of patio and grilling tools that will help make the most out of your time outside. Find grills and grilling gear for your next backyard barbeque, propane tank accessories, hideaway patio storage, yard games, serving utensils, and more affordable outdoor maintenance solutions. For over 50 years, Sporty's Tool Shop has kept American homes and gardens looking their best, featuring home improvement tools, garden and lawn care supplies that not only get the job done, but get the job done right.